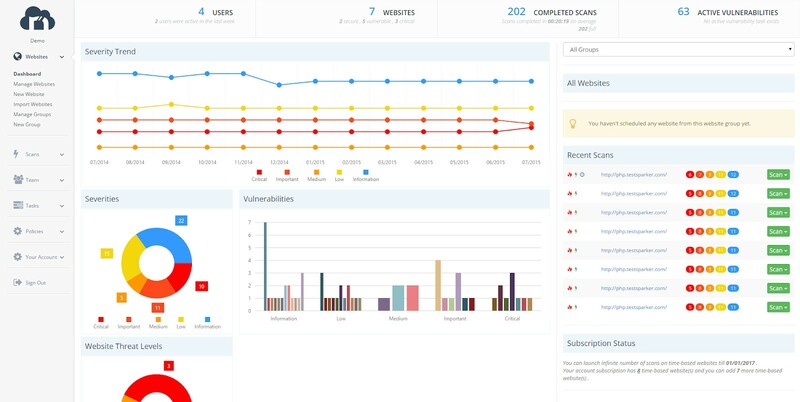 In both Netsparker Enterprise and Netsparker Standard, the Dashboards enable you to view scan results, vulnerabilities, issues, statistics and other information from a single window – while scans are running and once they are completed. The Netsparker Enterprise global dashboard provides you with an overview of the security status of all Website Groups and Websites in your Netsparker Enterprise account. For further information, see Global Dashboard Panels below. This table lists and explains the panels in the Global Dashboard window. This chart displays the increase or decrease of each Vulnerability Severity Level over time. This doughnut chart displays the number vulnerabilities found, grouped be Vulnerability Severity Level, in proportion to the total detected. This clustered column chart shows the number of Issues found, grouped by Vulnerability Severity Level. This doughnut chart displays the total number of Critical and Insecure issues. This is a column chart that displays the average length of time it takes for Issues to be fixed, grouped by Vulnerability Severity Level. This is a column chart that displays the number of Issues that have been fixed in each Vulnerability Severity Level. At the top right of the window, there is a dropdown. Click to view the security status of all your websites, or certain groups only. This is a panel that displays a list of Scheduled Scans. For further information, see Scheduling Scans. This panel displays a list of Recent Scans. Hover the mouse over various icons to see how what types of Vulnerabilities have been detected. This panel displays the latest detected Issues, with an icon indicating their Vulnerability Severity Level. The Global Dashboard is displayed, by default, as soon as you login. Alternatively, from the main menu, click Websites then Dashboard. The Global Dashboard is displayed. For further information, see Global Dashboard Panels above. The Scan Summary Dashboard enables you to view the results of the latest security scan for a single website – while the scan is running and once it has been completed. You can also view other completed security scans with the same configuration, such as those with the same Scan Policy and Scan Settings. This table lists and explains the panels in the Scan Summary Dashboard window. Click Trend Matrix Report (Severity Trend Report) for a more comprehensive overview. This is a column chart that displays how long it takes for Issues to be fixed on average, grouped by Vulnerability Severity Level. This is a list of all the issues detected in the scan. At the top right of the window, there is a dropdown. Click to view the security status of an indiviual Website Group or websites grouped by Scan Scope. This panel contains the subscription expiry date. From the main menu, click Scans, then Recent Scans. The Scans window is displayed. 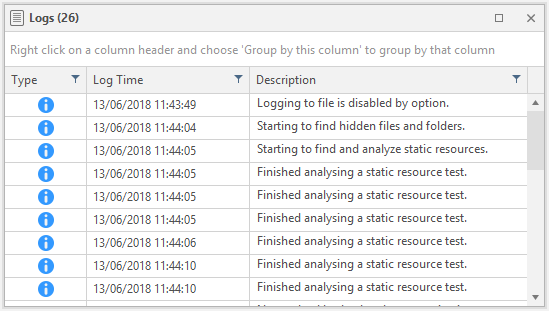 Click on the Name of any individual single scan. The Scan Summary Dashboard is displayed. For further information, see Scan Summary Dashboard Panels.. When you open Netsparker Standard, the Welcome Dashboard is displayed, and the Start a New Website or Web Service Scan opens. Close the dialog to view the following areas in the window. 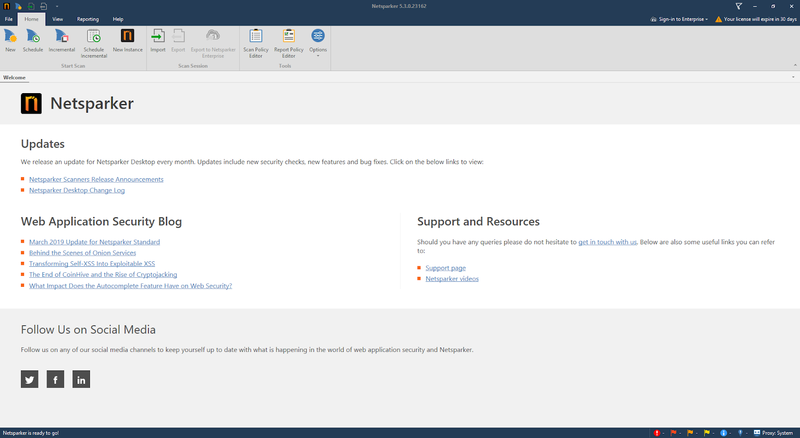 The Welcome page also also contains links to Updates, the latest articles in our Web Application Security Blog, along with Support and Resources links. For further information on menus and ribbons, see Navigation in Netsparker Standard. The Scan Summary Dashboard enables you to view the results of the latest security scan for a single website – while the scan is running and once it has been completed. This section lists and explains the panes in the Scan Summary Dashboard window. 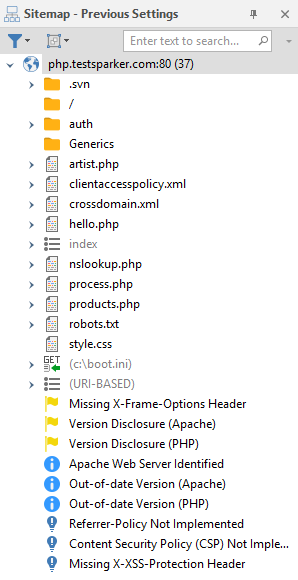 The Sitemap pane displays a list of all the directories and files that the scanner crawled. Within each file, all identified vulnerabilities, security flaws and vulnerable parameters are listed. 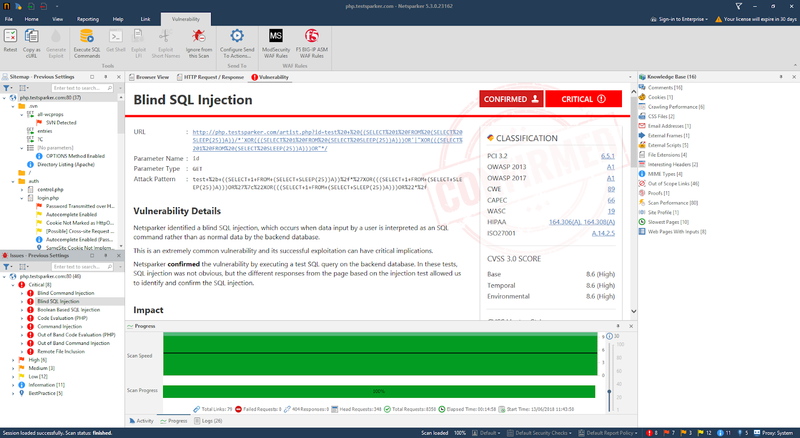 Attack Radar displays a circular chart shows the ongoing progress of each security check (SQLi, XSS) during the scanning phase (before most of the SQL Injection attacks have been performed); at the end of the scan, the chart indicates all security checks that have been tested and how many vulnerabilities were found of each type. The Logs pane displays a list of all scanner actions that have taken place during the Scan. The Issues pane lists vulnerabilities by type, severity, confirmation and URL. 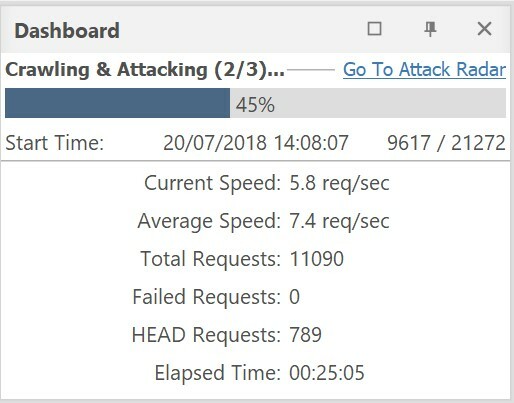 The Knowledge Base pane displays a list of additional information about the Scan, such as number of comments and cookies, crawling and scan performance and slowest pages. Click on each one to view its details displayed in the central pane. Load a previous scan or launch a new scan. Click the View tab. The Dashboard is displayed, showing the default panes: Sitemap, Dashboard, the Central Pane, Logs, Issues and Knowledge Base.